The Kanonenjagdpanzer is a German tier 8 premium tank destroyer. 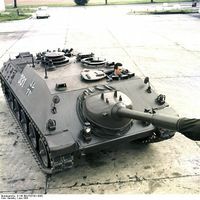 The first prototypes of the Kanonenjagdpanzer, also known as the Jagdpanzer Kanone 90mm, were produced in 1960 by the Hanomag and Henschel companies for the FRG. Production continued until 1967. A total of 770 vehicles for the Bundeswehr and 80 for the Belgian Armed Forces were built. However, in 1985 the vehicle was deemed outdated. Some of them were converted into artillery observation vehicles and others were refitted into anti-tank guided missile carriers. Some Kanonenjagdpanzer remained in service until 1990. The Kanonenjagdpanzer is essentially a turretless Ru 251. It is very fast and maneuverable, especially for a tank destroyer, although very lightly armored, and uses a slightly more powerful version of the Ru 251's gun. Very high mobility and hull traverse. Low profile, with good camouflage rating while stationary and moving. Good accuracy and fast aim time. Relatively wide gun traverse and elevation angles. Minimal armor that is vulnerable to HE shells. The Kanonenjagdpanzer may seem similar to the E 25 on the surface, but there are some key differences. For one thing, the KanJPz is a lot larger, which limit the places where it can hide and use its camouflage. It also has much less armor than the E 25, and it cannot play as aggressively. Large caliber HE must be avoided at all costs, and artillery is an extremely serious threat. The 90 mm DM1 is essentially the same gun as used on the Ru 251, with somewhat better AP penetration. It has a unique HE shell with 102 mm penetration, which can be useful when fighting against light tanks or lightly armored tanks but is otherwise highly situational. With only 250 mm of penetration even with the HEAT shell, the KanJPz will struggle against Tier 10s from the front, and it is generally better to seek flanking opportunities. For a 90 mm gun, the DM1 also has a relatively low rate-of-fire, which is a big disadvantage in any slugfests. The gun has relatively good traverse and elevation angles, which allows the KanJPz greater flexibility in positioning. Good aim time and accuracy mean that the KanJPz excels as a mobile sniper that can setup quickly. The mobility of the KanJPz is very good, especially for a tank destroyer. While it will struggle to reach 70 km/h except on flat ground, it can still maintain a very respectable 55-65 km/h on most terrain. The hull traverse is also very good, which allows it to react quickly to changing situations or getting flanked. Unfortunately, the slow gun traverse speed will have trouble keeping up with the hull traverse, and this can be a problem in close combat. The Kanonenjagdpanzer (also known as Jagdpanzer Kanone 90mm, or tank destroyer, gun) was a German Cold War tank destroyer equipped with a 90mm anti-tank gun from obsolete M47 Patton tanks. Its design was very similar to that of the World War II Jagdpanzer IV. This page was last modified on 22 October 2018, at 18:58. This page has been accessed 61,715 times.